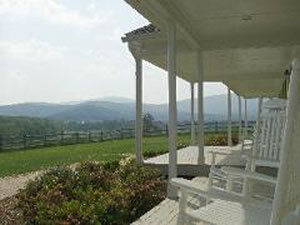 Description - Whether a romantic weekend getaway, a gathering of family and friends, an anniversary or a personal retreat, we invite you to experience the luxury of our unique vacation rental properties on two large farms in the foothills of the Blue Ridge mountains in Central Virginia, The Gateway to the Blue Ridge Mountains. Picture yourself sitting here!! Enjoy the peace and solitude of the private country house at High Fields Farm or one two cottages at nearby Fairhill Farm . 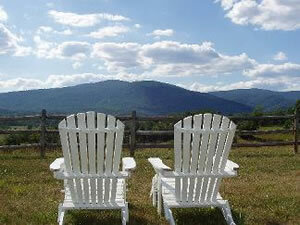 Our three separate rentals are privately situated on our two large farms. 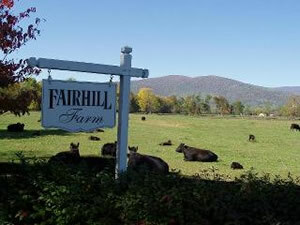 Take in the nearly 300 acres overlooking the South River Valley with a breathtaking landscape of gently rolling fields and panoramic mountain views. 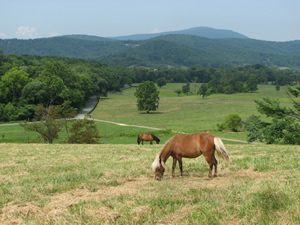 Spend the morning or afternoon exploring nearby Charlottesville, Three Presidential homes, Monticello, Ash Lawn and Montpelier, The Shenandoah National Park, Skyline Drive, The Appalachian Trail, Luray Caverns, many wineries, local pottery and antiques stores. Take a day trip to Colonial Williamsburg, Kings Dominion or Washington, DC and return to the serenity of your elegant private retreat where you can enjoy a dip in the pool in summer or the warmth of the fire in fall and winter.